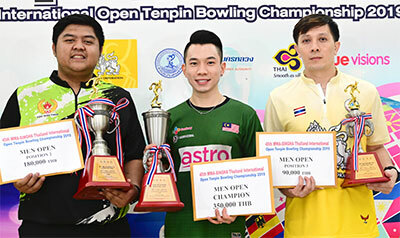 15th April, Bangkok: Topseeds, Adrian Ang and Siti Safiyah Amirah captured the Men's and Women's Open Masters titles of the 45th MWA-Singha Thailand International Open to give Malaysia a clean sweep at Blu-O Rhythm & Bowl Ratchayothin on Monday. Ang, who picked up the Penang State Sportsman Award two days ago, needed only one match to defeat challenger and winner of the first and second Men's Open stepladder matches, Billy Muhammad Islam of Indonesia, 217-193 to win the title. Both title contenders had a bad start with splits in the opening frame and the Indonesian suffered another split in the second frame putting him on the back foot. Whilst the 31-year-old Malaysian could not pull away with the advantage, Islam recovered with a double strike in the third and fourth frames to draw level. Ang then stepped up his pace with three consecutive strikes to take slender lead of 13 pins when Islam responded with another double in the sixth and seventh frames. The topseed went on to seal victory with a double in the ninth and tenth frames. The champion, who went home to Penang after his first block of qualifying rounds to receive his award, returned just in time to complete his second and third blocks of qualifying. Ang picked up the top prize of 300,000 Thai baht (approx. US$9,450) and a trophy. His last victory came two years ago when he won the ABF Tour Macau leg. Islam, who defeated fourth-seed, Kim Kyung Min of Korea and compatriot and fifth-seed, Ryan Lalisang, 234-216-204 in the first match, took home 150,000 baht. The first runner-up also ousted second-seed, Tun Hakam of Malaysia and third-seed, Surasak Manuwong of Thailand, 212-191-192 in the second match to meet Ang. Manuwong settled for 75,000 baht as second runner-up while Hakim, Kim and Lalisang earned 40,000, 25,000 and 20,000 respectively for finishing fourth to sixth positions. Ang ended the earlier Round 3 finals in the lead with 1449 followed by Hakim in second with 1379. Manuwong finished third with 1376 ahead of Kim in fourth with 1366. Round 2 winner, Lalisang took fifth spot with 1361 while the sixth and final stepladder spot went to Islam with 1360. Muhd Jaris Goh of Singapore missed the cut by 22 pins in seventh. 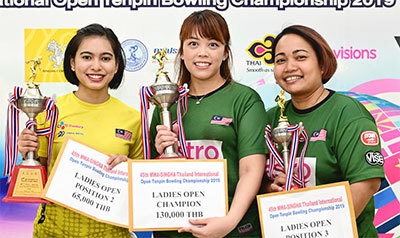 Meanwhile in the Women's Open division, Malaysians stamped their prowess by sweeping the top three podium places with topseed, Siti Safiyah Amirah claiming a well deserved victory over team-mate and challenger, Nerosha Keligit, 257-216 in the all-Malaysian championship match. Safiyah wasted no time in taking a huge lead when the 29-year-old rolled seven consecutive strikes from frame two as Keligit was playing catch up. Although she knocked down three consecutive strikes from frame five, Saifiyah ultimately sailed through with the win. The champion, whose last win was the PWBA Wichita Open in 2017, won 100,000 Thai baht (approx. US$3,150) for her effort. Keligit, who brushed aside second-seed, Chan Shuk Han of Hong Kong and winner of the first match, Shalin Zulkifli, 235-184-213 in the second match, earned 50,000 baht. Zulkifli, who edged fourth-seed, Sin Li Jane and sixth-seed, Radin Nur Najwa, 231-200-226 in the all-Malaysian first match, took home 25,000 baht. Chan, Radin and Sin were awarded 20,000, 15,000 and 10,000 baht respectively. Saifyah earned topseed after finishing the earlier Round 3 finals with 1347 followed by Chan with 1314. Keligit took third spot with 1310 while Sin finished fourth with 1304. Zulkifli claimed fifth spot with 1282 while Round 2 winner, Radin clinched sixth position with 1274. Seventy men and 33 women participated in the 45th edition of one of the most popular tournament in Asia. They contested three blocks of five games each over three days at Blu-O Rhythm & Bowl Ratchayothin.